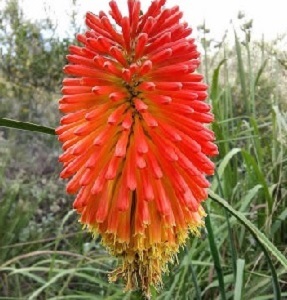 An original species of Kniphofia from Southern Africa, making a very attractive garden plant well suited to the UK climate. The Common Marsh Poker has soft narrow leaves and displays showy yellow to orange flowers late in August to September. It grows 1.0m to 1.5m in height and is a wonderful late summer plant for borders or pots. Good cut flowers. Plants prefers a sunny to part shady site with rich soil. They grow in most soils except heavy clay. They tolerate coastal gardens and some drought once established. Pack of 20 seeds. Sow spring to autumn or anytime with a heated propagator. Sowing instructions and a colour photo are printed on the packet. Sow spring to autumn in moist seed compost and cover lightly with soil. Germination takes 2-4 weeks, sometimes up to 6 weeks. Or sow anytime and keep at 15-25°C, and a bit cooler at night. Transplant seedlings into pots when they are large enough to handle and then out into the soil in a well drained sunny or part shady spot. Summer/autumn sowings should be protected in the first winter (in a greenhouse or coldframe). Grow Plant out into the garden or pots when the plants are about six months old, after hardening off. Plants are evergreen, but leaves may die back in cold winters and should regrow in spring. Trim back spent flower stalks and untidy leaves as necessary. Mature clumps of rhizomes can be divided in autumn.